Lorma Colleges as the hub of research excellence equipped with the capacity to strategically leverage its intellectual assets, knowledge resources and ICT infrastructure to pro-actively respond to the needs of the ever-changing landscape of the institutional, regional, national, and global environments, imbued with the social responsibility of developing and nurturing human and community potentials. The Research and Development Office acts as the strategic lever of Lorma Colleges in propagating the mindset essential in developing the capacity to sustain the momentum of research production and in nurturing the heartset essential in institutionalizing a research-driven culture in collaborative partnership with the research teams, faculty, staff, and students. governance and management; effective and efficient management of the research processes and resources; the preparation of its students and faculty to be members of a more cohesive world; the generation of knowledge on a more global orientation; and the provision of its academic resources, to the extent feasible, to institutions involved in international activities. 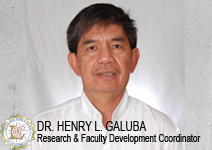 The head master to the college’s conglomeration of researches and academic papers, Dr. Henry Galuba maneuvers the school’s efficiency to achieve a novel output of research enthusiasts and scholars not only in the province but also in the region. Download below the complete digital version of the College Research Manual in PDF format.